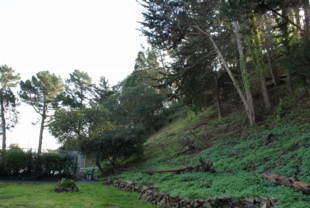 Corona Heights Park is a craggy outcropping located along Roosevelt Way (between Museum Way and 15th Street) and next to the Randall Museum. 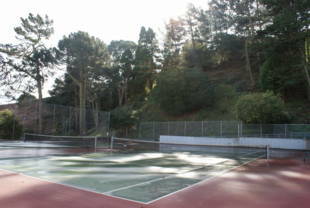 On the north side of the park is a playground with a children's play structure and a pair of tennis courts. Below the boulders is a dog run and grassy field suitable for tossing a frisbee or a baseball. More information, including community garden plot availability, is located on the Recreation and Parks Department Urban Agriculture website. 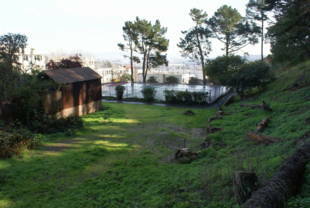 Corona Heights Park is owned by the San Francisco Recreation and Parks Department. Bus 37 to Masonic and Upper Terrace and walk one block east to the park. It's been known as Rocky Hill, Rock Hill, San Francisco's Secret Park (by writer Margot Patterson Doss) and the Fist (from the upthrusting chert rock boulders at its 540 ft. peak). In the 1800s, Rock Hill was the site of a quarry and brick factory owned by the Gray Brothers. George and Harry Gray also owned an infamous reputation for substandard production, non-payment of their workers, and injuries to people from falling rocks. One of the brothers was killed by an unpaid worker in 1915 and the quarrying ended in the 1920s. But the streets winding down the hill from the kilns, endured, and their spectacular views turned them into prime real estate sites. People bought them and built homes that touch on the Haight-Ashbury, Castro, and Corona Heights neighborhoods. In 1928, Josephine Randall, the Recreation Superintendent of San Francisco, proposed that the City buy the 16 acres of Rock Hill for recreation, and in 1941, it was purchased for $27,333 and officially named Corona Heights. Designated as a natural area, the Park hosts a range of native and non-local life and plants--lizards, garter snakes, raccoons, opossum, grasses, wildflowers, birds and butterflies. It also hosts the Randall Museum, named for the woman who relentlessly and successfully fought to establish it. The Museum opened in 1951 at 199 Museum Way and in succeeding years has developed into a community institution for all ages. Focusing on the culture and environment of the San Francisco Bay Area, it offers arts and sciences classes, a California native animals room, and workshops for children, teens and families. The Randall Theater's program presents performances by the Young People's Teen Musical Theater and Musical Theater Works, a student theater. Community groups use the facilities for meetings and lectures. 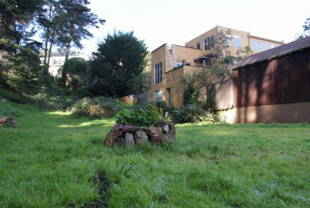 At the Outdoor Learning Environment are Learning Gardens, the Native Plant Garden, and from the observation deck, a panoramic view of San Francisco, the Bay, East Bay hills, and, when the air is clear, the snowcapped Sierra. www.randallmuseum.org. Visitors exploring Corona Heights Park will discover a children's playground, a nursery school, a community garden, and a fenced, off-leash park for dogs. They'll marvel at its famous 'Slick'n'Slides' - the 60 foot high sheer rock wall, looking in some places, as though it had been polished by a jeweler. Uphill toward the peak and down from it, walkers will corkscrew around hills and find pockets holding barbecue pits, tennis courts, and breathtaking views. Just below the peak, the flat lawn with picnic tables offers picnickers a spectacular view, and a risk that winds, sometimes extreme, will whisk their cups and plates out into it. A risk to the peak itself was reported by the press in 1961. 'Corona Heights To Bite the Dust?' asked the San Francisco Examiner, reporting that it was to be declared surplus property by the Recreation and Park Department and offered for sale by the city. Denying the rumor, Rec and Park's superintendent of recreation said that acquiring funds to develop the 16-acre hilltop, was 'unfeasible' and that the department had given up the idea. Corona Heights had a brief encounter with homeless camps two years ago. In October, 2007, on the hill behind the nursery school, thick brush hid encampments and piles of trash, syringes and broken bottles. Park officials, police officers, public works crews, and a team of goats who ate the brush, collaborated to clean up the grounds. Neighborhood residents of the informal Corona Heights Association pick up trash on their walks in the Park but it still lacks the attention of an organized Friends group.